“It’s a done deal and it’s going to be a third fight against Timothy Bradley. We took a lot of consideration knowing Bradley has improved a lot as a fighter since the last time they’ve met in 2014,” Arum told The Manila Times on Wednesday. As we also mentioned before, Bradley has gone under the guidance of renowned trainer and commentator Teddy Atlas, and made noticeable improvements to his boxing abilities in his last showing against Brandon Rios. Though personally, this is one of the less intriguing fights of the four mentioned, it will certainly be a competitive one. Bradley has held a dependable history of showing up prepared and ready to go for all his bouts, and is certainly hungry to make a bigger splash in the boxing world. 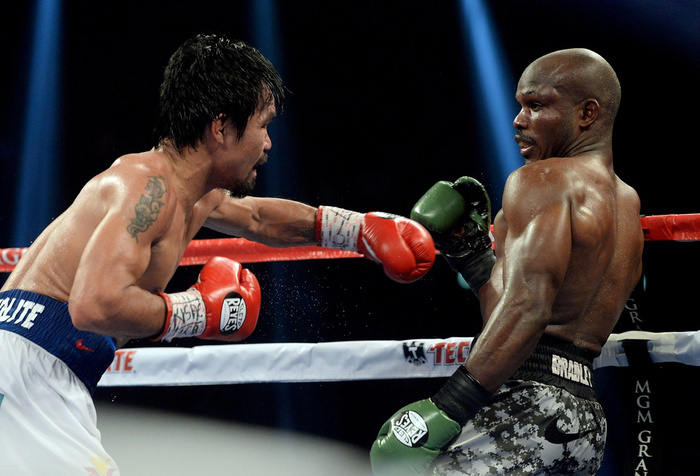 Also being reported is that the fight against Bradley will likely not be Pacquiao’s last fight. “It’s not going to be Manny’s last fight because anything could still happen and you know Manny. That’s why we won’t sell it that way. I don’t think it is Manny’s last fight,” Arum said in the same conversation with the Times. With Pacquiao reportedly healed from the torn rotator cuff he suffered during his fight against Floyd Mayweather, the fight with Bradley will be a good measuring stick to see how he would fare in future bouts, most notably a potential rematch with the retired Mayweather. That prospect, however, is unknown as Floyd Mayweather Sr. reported to Thaboxingvoice.com that a rematch is out of the question. Fans might not be too disappointed at the news since many felt letdown by the fight given all the hype leading up to it. But with the way fighters, promoters, and all involved parties change their minds in the sport of boxing, anything can happen. Stay tuned.